The job of the sales leader is a tough one. Most in this role got promoted by being a great sales person. However, at the leadership level, there is so much more than selling involved…that’s just the start of it! The responsibilities seem endless, as sales leaders work toward goals like: making sure the team hits its numbers, pitching new products and getting the team to use their CRM. Focusing in on key deals and forecasting accurately can be challenges if your pipeline is filled with fiction. Run a contest around updating stages on accounts in your CRM. EXAMPLE: Lawley Insurance wanted to improve forecasting. They ran a contest like this for 2 weeks and called it “Clean Up the Pipeline.” They saw a 110% increase in stage updates (188 total in the contest) that occurred during competition in comparison to the prior 7.5 months (171 total between 1/1-8/17). Learn more here. Companies invest a lot of money into new products – which hurts your company’s bottom line if no one is selling any. Motivate your team to sell new products by having a competition around deals closed on those products. To get reps rallied around the new product, the Pistons ran a 6-week competition around the sale of single-game suites. The competition took off. The result? They achieved their 6-month sales goal during this 6-week contest. 3. Get the team to use your CRM. It can be hard to get sales folks excited about your CRM if they don’t see the value in it. So make them see that value by getting them to use the platform more often; run a contest around logging events in the CRM. EXAMPLE: HelloWorld wanted to increase the number of events their sales team was logging, so they ran a 1-week competition where every event logged earned that rep a point. At the end of the competition, the winner would receive a $100 gift card to a local restaurant. Events shot up over 200% during the competition! Perhaps even more beneficial than the increase in events logged, reps also saw the value of having a central place to keep notes, define next steps and discuss important client conversations (tracked through events) with their managers. These three contest examples are just the tip of the iceberg. 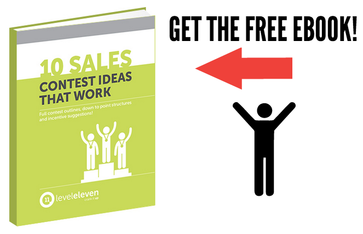 You can use sales contests to motivate anything that you need your sales team to be doing. Just make sure not to try and create competitions around all of those activities at once! Sales leaders: Check out these 3 sales contest ideas for help hitting your goals.